Methi paratha recipe – healthy breakfast paratha recipe made with whole wheat flour, fenugreek leaves, boiled mashed potatoes and spiced with some spices. The first time I saw this recipe on Sanjeev Kapoor’s cooking show. From then I am making it regularly in my kitchen. This is very easy to make healthy paratha. 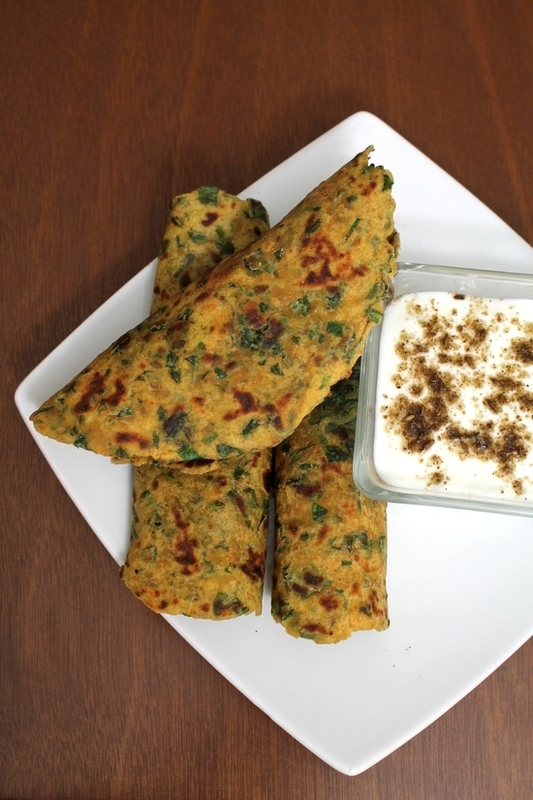 This methi paratha recipe is different from the usual paratha recipe. Boiled and mashed potato is added while making the dough. Yes, this is not stuffed paratha. This potato makes the paratha so soft. Thus, it will not get chewy even after it cools down. By now you might know that my family loves fenugreek leaves in any recipe. 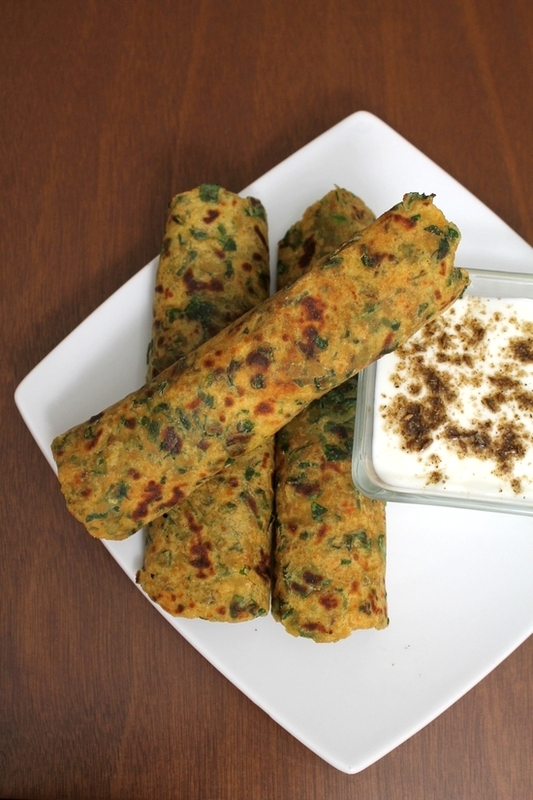 Thus you will find many many recipes made with methi leaves. Here are my most favorite are methi thepla, methi rice, methi malai paneer and bajra methi vada. As we love methi leaves, I have added good amount of leaves in this methi paratha. But you can reduce the quantity as per your liking. The addition of amchur powder in the paratha compliments very well with other flavors. The paratha itself is really flavorful and delicious that you can have it as such with cup of tea or plain yogurt. 1) Pluck the methi leaves and measure about 3 cups. Take large vessel filled with water. Soak fenugreek leaves in the water for 10-15 minutes. So all the dirt will settle down at the bottom and leaves will float on top. Now using your hand take the leaves part gently without disturbing the water and dirt at the bottom. Lightly squeeze out the water. Then chop the methi leaves. 2) In a bowl, take whole wheat flour. Add oil, cumin seeds, green chili, ginger paste, red chili powder, amchur powder and salt. 3) Mix well, so everything is incorporated well. 4) Now add chopped methi leaves and boiled, mashed potato. 5) Now start mixing it with your hand. It will look crumbly, but when you pinch together it will become a dough like. 6) Keep kneading till you get the smooth dough. Dough should be tight and firm (not soft). DO NOT ADD ANY EXTRA WATER. Moisture from the potato and water particles from the methi leaves are enough to make the dough. 7) Cover and let it sit for 5-10 minutes. No more that 10 minutes, otherwise methi starts leave its water and dough will be loose and sticky. After 10 minutes resting time, knead the dough once again and make it smooth. 8) Divide the dough into 12 equal portions. Make smooth ball and then flatten it between your palm to make like a disc. 9) For rolling the paratha, dip one disc into the dry flour from both sides. 10) Now start rolling using the rolling pin and board. 11) Roll evenly into 5-6 inch diameter circle. 12) Heat the tawa on medium heat. Once hot, place the rolled paratha on it. 13) Wait for few seconds, you will notice few tiny bubbles on the surface. That time flip the paratha. 14) Cook other side for few seconds. Then apply oil on it. 15) Flip it, so oil side is down. Cook it by pressing it very lightly and gently using spatula. Cook till bottom side is browned. 16) Apply some oil on top part. 17) Then flip it. Again cook by pressing with spatula. 18) Again cook till bottom side is no more doughy and browned. Remove it from the tawa. Keep in the insulated container, so paratha stays warm. Repeat the same for rest of the paratha. 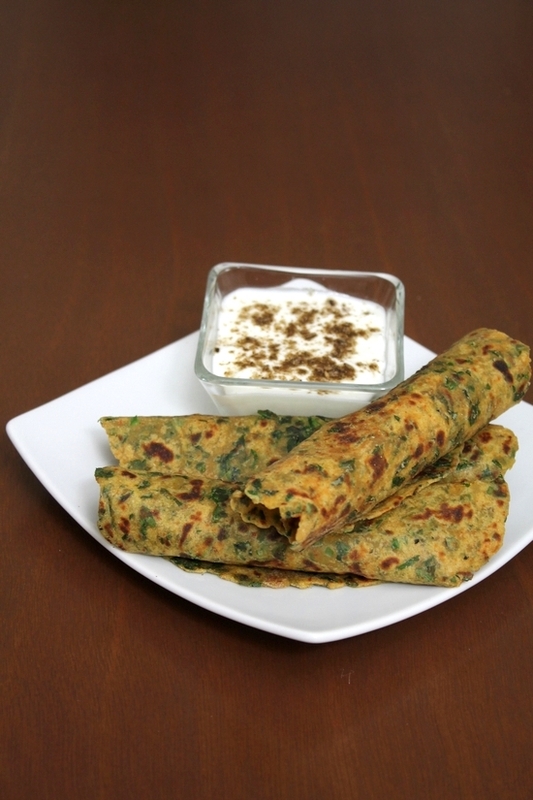 Serving suggestion: Serve methi paratha as a breakfast. You can have it with cup of morning tea. Or serve with plain yogurt or any raita or pickle. Boil the potato in the pressure cooker till soft or use leftover boiled, mashed potato. Pluck the methi leaves and measure about 3 cups. Take large vessel filled with water. Soak fenugreek leaves in the water for 10-15 minutes. So all the dirt will settle down at the bottom and leaves will float on top. Now using your hand take the leaves part gently without disturbing the water and dirt at the bottom. Lightly squeeze out the water. Then chop the methi leaves. powder, amchur powder and salt. Now add chopped methi leaves and boiled, mashed potato. Now start mixing it with your hand. It will look crumbly, but when you pinch together it will become a dough like. Keep kneading till you get the smooth dough. Dough should be tight and firm (not soft). DO NOT ADD ANY EXTRA WATER. Moisture from the potato and water particles from the methi leaves are enough to make the dough. After 10 minutes resting time, knead the dough once again and make it smooth. Divide the dough into 12 equal portions. Make smooth ball and then flatten it between your palm to make like a disc. For rolling the paratha, dip one disc into the dry flour from both sides. Now start rolling using the rolling pin and board. Roll evenly into 5-6 inch diameter circle. Heat the tawa on medium heat. Once hot, place the rolled paratha on it. fry the paratha till both sides have golden brown spots and it is cooked. Remove it from the tawa. Keep in the insulated container, so paratha stays warm. Repeat the same for rest of the paratha. Nice to hear that your family liked it. I would like to try this recipe. Can i use frozen methi leaves instead of fresh ones? Yes Anitha, you can use frozen methi leaves. just reduce the quantity of methi leaves. use only 1 to 1 1/2 cups of methi if using frozen. procedure will be same. Hope this helps.